What caught my eye here? Sure it was the redness of the leaves of the acer, but, what made them even more eye-catching was where the tree was growing, in the midst of luxuriant greenery. The red contrasts with the green strikingly, so the acer does not just stand out because of its redness, but because of the environment in which it is growing. Had this acer been growing in a forest of acers, it would still have been striking, but this particular one, this individual tree growing in the village of Aubterre-sur-Drone, really captured my attention because it was growing amongst such green plants. This highlights two important principles related to a focus on difference – contrast and context. When we focus on difference we become more aware of both contrast (just how different this particular whatever is) and context (exactly where we are seeing the existence of whatever it is). In other words, to really focus on the difference is not to see something in isolation, but in its relatedness. Contrast is a comparison between something and something else. Context is the place and the time where the something is being observed. I think this is a point we often miss when we think of difference because there is a tendency to think that if we concentrate on individual uniqueness, we are isolating something, or somebody. I don’t think that is true, or at least, not necessarily true. To really see the uniqueness of anything we have to see it in its connectedness – in its situation, in its particular time and place, in its relationships to “other”. To see you in your uniqueness, in your difference, I have to hear your story. I have to explore some of the myriad of links and connections you have in the world. If I try to see you in isolation, I won’t fully see you. If we are to prioritise difference, we have to start noticing it more. One way to notice difference is to spot the unusual. This is one of the easiest ways because its the very fact that what we are seeing is SO different which catches our attention. I’ve seen some interesting and different species of birds in my garden here in the Charente, but yesterday look what appeared! I have never, ever seen a bird like this! 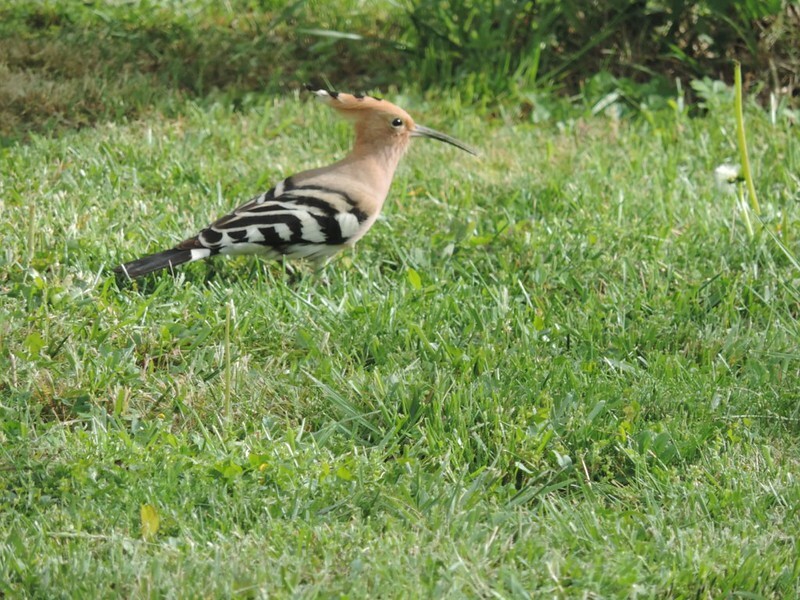 It seems it is a “hoopoe” – nope, I hadn’t heard of it either. But isn’t he spectacular? Only the one, not a pair, and certainly not a flock. He pecked around and had a bit of supper then flew off. Maybe I’ll never see a hoopoe again, but it was a sheer delight to see one this time! What is unusual is often striking. And what is striking catches our attention easily. The pleasure and delight can be maximised by allowing your attention to be caught and then lingering awhile – spending a few minutes just watching, noticing, enjoying. Has anything unusual caught your attention recently? For many weeks I’ve noticed a Robin in my garden, but recently this little guy has turned up. At first I thought he was maybe a different Robin, or maybe a Bullfinch (I’m not an expert in birds!) but I’ve just discovered he is a “Redstart” with his red breast, black mask and white skull cap. 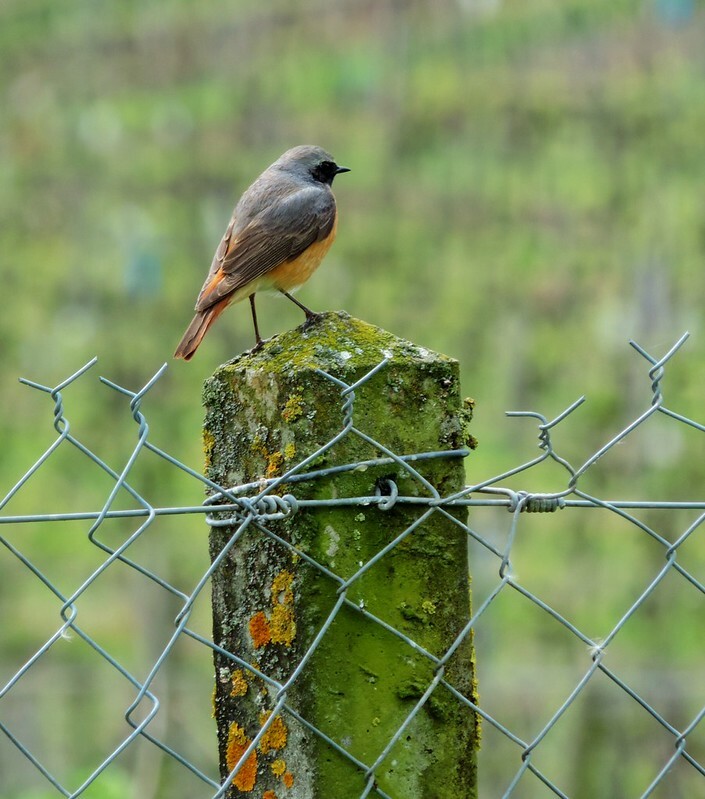 I’d never even heard of a “Redstart” before but apparently they are from the Robin family – you can see similarities with the more common Robin, but he is clearly different. We live in a society which prioritises sameness. Mass production, mass consumption, standardisation, health care by protocol, science based on abstraction and categorisation. We do have a lot in common, and that’s partly how we connect to others – shared interests, preferences, values and so on. I was aware throughout my practice as a doctor that every single person I saw had some things in common with others who I had seen, but who also was unique – different from every other person I had seen. I’d make a diagnosis – chest infection, diabetes, asthma, psoriasis etc by prioritising the signs and symptoms which I had learned were associated with those diseases, but then I had to pay attention to the person and ask who this was who had this disease, ask how it appeared in their particular life, how it affected them in their unique way. What I’m wondering just now is what might the world be like if we prioritised difference instead of sameness? What would health care look like if we prioritised the uniqueness of every patient AND every practitioner? What would the economy be like if we prioritised the uniqueness of each member of the population? What would education be like? What would society be like? Are there certain underlying principles which would come to the fore if we prioritised difference? I’m going to explore those questions here over the next few days. The dominant idea in our society seems to be one of control. From the economy, to society, to health and education, those who hope to improve matters have been seduced by a certain philosophy (typical of what is referred to as “scientific”) which is based on measuring starting points, setting end points and employing the tools to control the process of moving from the one to the other. Actually, in “open systems”, which are “complex” (based on multiple non-linear relationships between the parts), this idea fails to match reality. We cannot completely measure or control living systems. So, here’s the question – what is an “appropriate environment”? What sets the conditions for health? For the creation of healthy individuals, healthy societies and healthy economies? I took this photo of my son and his children on the beach at Saint George de Didonne recently. It so happened we were the only people on the beach at that point. In my A to Z of Becoming, P can stand for Pause. I wonder how you make the pauses in your life? In the part of France where I live now Sundays are still a very different day of the week. Shops close – even the supermarkets – and the pace and feel of a Sunday is distinct. In many societies we have lost that regular point in the week where we can step off the treadmill, relax, sit back, reflect, or do whatever we need to do get a bit of space again in what so often is an over-stuffed busy week. Holidays can be a time to pause too. A few days in the year where we can just step out of our routines and get the chance to re-connect to ourselves, our values and our priorities. A time of pause gives us the chance to make conscious choices because it creates a space – in turn, this gives us a chance to shift our perspective and see our lives in their contexts. So, maybe it would be good to work out where you can create your opportunities to have pauses. And maybe you should allow yourself to enjoy one sometime very soon! Living surrounded by vineyards is influencing my perspective on life. There is a little shop next to the tourist information office in the nearby village of Segonzac where you can drop by and taste a cognac or two and explore the individual produce of several local distillers. This is small scale cognac production – families who have worked the same vineyards for generations, tended the vines, plant by plant, through the seasons of each year. Every year they strive to produce the best quality grapes they can from their vineyard. And each year they strive to produce the tastiest cognac they can – taste which is not just pleasurable but unique and distinctive. It’s delightful to head home with a bottle of cognac produced 40 years ago by the father of the man who sells it to you. The focus is quality. Quality and that unique, distinctive flavour. 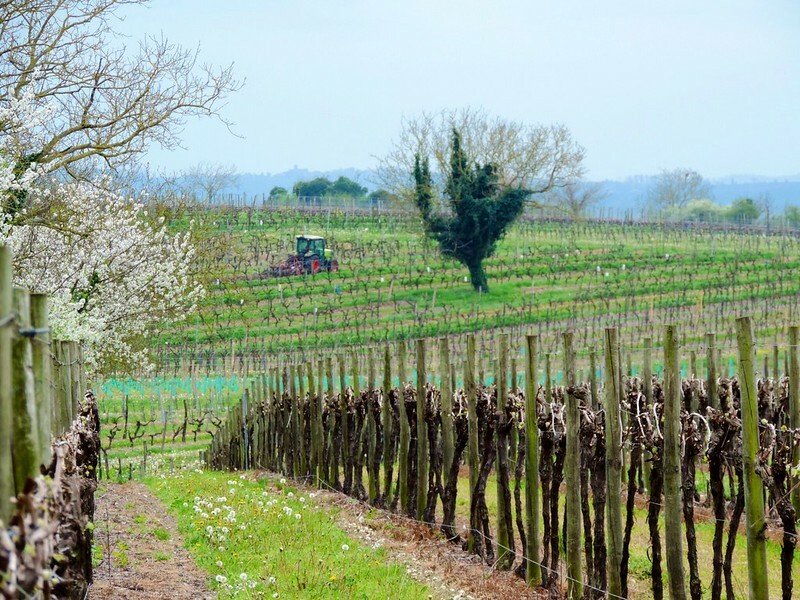 These vineyards and distilleries have been productive for years and years. They don’t “succeed” by producing more and more every year. They don’t survive by buying up all the surrounding vineyards and becoming global mega-corporations. (there are cognac producers in the area which are a bit like that – big, multinational companies). They thrive by doing well what they do well. Their focus is on quality and what makes their particular cognac unique. We hear so much these days about the need for “growth” – more consumption, more production, more sales, more profits. We create stories by weaving together the past, the present and the future. Stories have a direction. They develop from “once upon a time” and lead up to “The End”. Although we can always find a “prequel” and a “sequel” which layer this story into another one. No life exists in isolation. The story of the Universe is a story of change…..from a time about 14 billion years ago of the emergence of stars which became great creators of, ultimately, all the elements of the Periodic Table, to the creation of the Earth, Life on Earth, and the evolution of consciousness. We haven’t reached “The End”. The Universe story is still being unfolded. The story of Life is a story of change……every single organism is born, matures, and dies. The story of any individual is a story of change. We develop from a single, fertilised egg, to this incredible complex, adaptive organism with astonishing powers of adaptation, resilience, self-healing and growth. Your story is a story of change. Your story is embedded in multiple layered stories of others. And here is the most exciting thing – YOU are the author, and the hero, of your unique personal story. Every day you write the next few pages as you live them. You write today’s passages from the memories of all the ones which went before, woven into the events and experiences of today, set within the framework of your hopes and expectations which you create with your imagination. You write today’s passages, and indeed your entire story in the context of the multiple stories you hear from others – family stories, friends’ stories, colleagues’ stories, and the stories told by the Establishment, the Media and others. Finally, your story becomes a stimulus and an influence on others. Others will write their stories, live their lives in particular ways, partly because of the stories you create and send out into the Universe through the way you live your daily life.